I was wandering around an antiques store in Checotah, Oklahoma (home of Carrie Underwood) when I came across this magazine. $10,000 in cash prizes. Love at 40. OK, I’m listening. 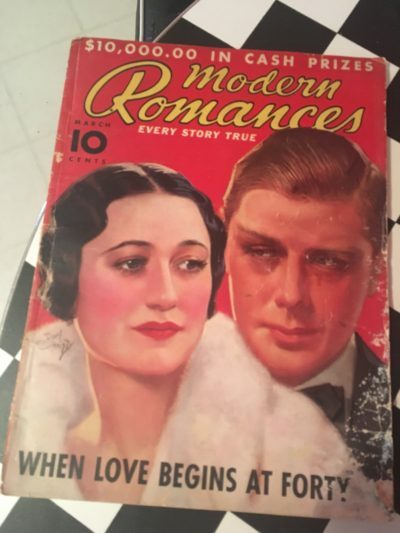 I’d never heard of Modern Romances magazine, but I picked up the copy, which was sheathed in protective plastic, and I searched for the issue date, March 1939, and the cost to me for buying it. Three dollars, a number that almost exactly matched my curiosity. “This looks interesting,” the woman behind the register said, as I placed it on the glass counter. “Ten thousand dollars was a lot of money back then,” she said, taking off her glasses to inspect closer. “Probably something sexist,” she said, sliding the magazine into a plastic bag, and we shared a laugh, and I headed back into to the crisp late January afternoon and got back on the highway. Lest anyone suspect the world hasn’t changed, please note: The gray-haired lady at the antiques store in Checotah, Oklahoma just made a gender critique. I bought the magazine because modern romance is a theme of the memoir I’m working on now. The book looks back on past relationships with men, but also with my troubled relationship with my own body, and in conversation, as well as on some mornings when I hunch over my laptop in the pre-dawn, I have struggled to explain how these two themes converge. A writer will search for clues on any surface. Maybe, I thought, cracking open my Modern Romances magazine at a diner down the interstate where I ordered an old-fashioned malted, I’ll find an answer here. The cover story turned out to be about Edward, the Duke of Windsor, who abdicated the throne for Wallis Simpson, a stirring love story to be sure, but not one with much relevance to me. I was briefly sucked in by a juicy confessional written by a woman who seduced her sister’s husband (Headline: “He Was Hers, But –“). The font was tiny, though, and the story went on and on, and eventually I began scanning the magazine for ads instead. 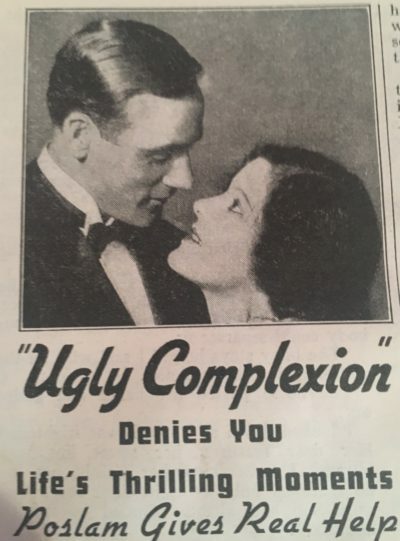 Ads are silly in any era, but ads from the early 20th century targeted to women are in a special category of ridiculous. I found three laxative ads, right on top of one another. 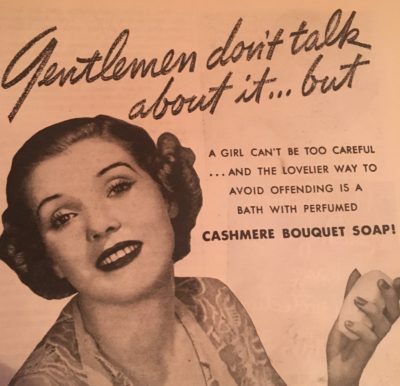 At first I was like, what was going on with American women and their bowels in 1939? Then I remembered back to my high school days, when girls trying to lose weight would eat laxatives. 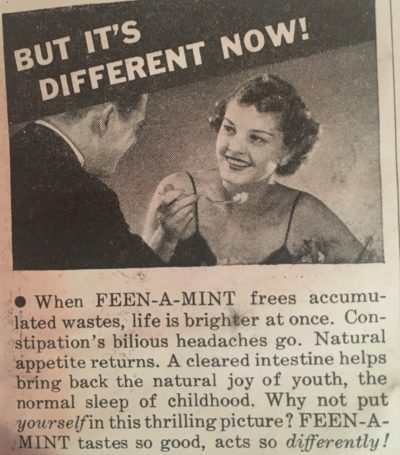 A brand named Olive Tablets touted itself as “the laxative of beautiful women.” Then there was this ad for a chewing laxative called Feen-a-Mint. Of course, women didn’t only want to lose weight. They sometimes needed to gain weight. It struck me how often men appeared in these ads. They offered approval or disapproval, they dispensed pills and love. It had been less than twenty years, remember, since women had gotten the vote. You couldn’t do much without a man in those days. Doctors gave diagnoses to your husband. Men bought the houses and the cars. Bars remained largely off-limits to women until the 1970s. The Seventies! It’s a constant source of amazement for me — how reduced our perimeter was once. So the ads were ridiculous, yes, and it was hard not to cringe at the body shaming and flimsy emotional manipulation. Nobody will ever love you if you don’t buy this ointment. And yet, I couldn’t help wondering if the little girl who grew up amid the Madonna videos and the fad diets of the Eighties, and the woman who got sober in the era of yoga pants and mindfulness, isn’t still operating out of some of these core anxieties. I have enough beauty products in my bathroom right now to start my own Sephora. I bought two Keto cookbooks at Whole Foods last week. I order my body lotion from Amazon because I’ve become so enamored of this one coconut scent. And maybe all of this marks me as a capitalist tool, but maybe it’s also because these anxieties haunt us in any era. That we are not enough. That something is wrong with us. That we could get what we wanted, if only this, if only that. What a beautiful fantasy: That we could BUY our way into happiness. That dress, that house, that man. I tossed the magazine in the back seat of my car, and headed to Arkansas, where I was visiting a friend. I’d brought zip-up boots and my butter-smooth leather jacket for the theater Saturday night, but it snowed so hard the show was canceled, and I hung around her cozy place in hiking pants and a big rainbow sweater. We had the loveliest time. A few days later, I stopped in Checotah on the drive home, but the door to the antiques shop was locked. Lest anyone suspect the world is changing too fast, please note: The entire town of Checotah, Oklahoma, is closed on Sundays. I don’t have an ending to this. I didn’t find my answer, but maybe I found clues. Looking at all these ads reminded of a line Don Draper once said. “What you call love was invented by guys like me to sell pantyhose.” I loved Mad Men. I miss Mad Men. Don Draper was so good at knowing exactly what other people wanted. But when it came to what he wanted — he was just as lost as the next fool.